Preheat oven to 375°. Heat a large pot of water two-thirds of the way full, until it begins to simmer. As the water is heating, place the sliced mushrooms in a bowl and toss with the salt and garlic. Saute the mushrooms in a large nonstick sauté pan, over a medium heat, stirring frequently until the mushrooms are cooked, yet firm. Place the mushrooms in a pot, add the pasta sauce and cayenne (optional) and simmer together for 10 minutes, then turn off the burner. When the pasta water begins to simmer, add the lasagna noodles. Cook until the noodles are a little firmer than “al dente”. Drain the water from the pasta and refill the pot with cold water. Set the pot of noodles to the side. Prepare the spinach filling. Crumble the tofu well, mix the remaining ingredients together, except parsley, reserve for garnish. Layer the pasta. When you are layering the pasta, pat dry each piece on a clean towel as you go. Cover the bottom of a 9 x 11 baking dish with a layer of the sauce. Then, layer the pasta over the sauce, leaving a little space between each noodle for expansion as the lasagna bakes. 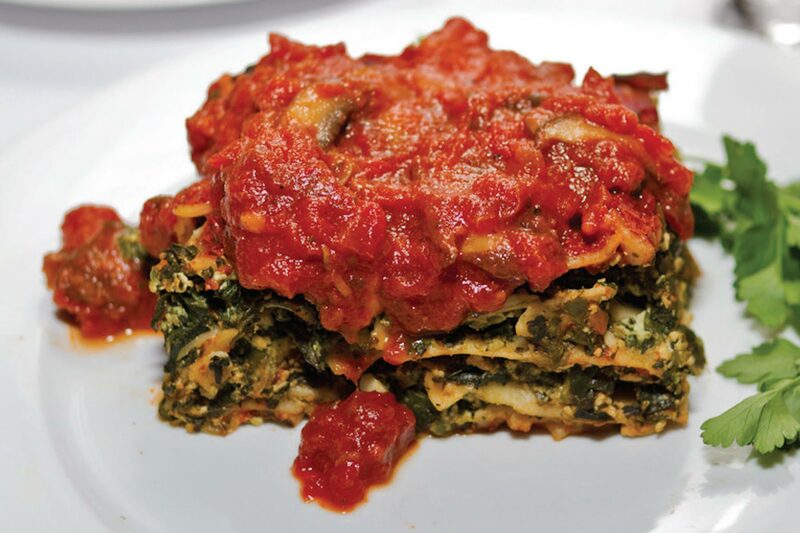 Divide the spinach filling into 4 equal parts and spread each part evenly over the bottom layers of pasta. Continue alternating the pasta and spinach layers until you have five layers of noodles and four layers of filling, finishing with pasta on top. In the middle, add a thin layer of sauce on top of the second layer of filling. Cover the final layer of pasta with sauce, cover the pan with a cookie sheet and bake for 30 minutes. Remove the cookie sheet and bake for another 30 minutes. Remove lasagna from the oven and let it sit for 10 minutes before cutting it into servings with a serrated knife. There will be some sauce left over which you can spoon sparingly over the servings after you plate them. Garnish lasagna with the parsley.